By Steven Lucas | Mar 2, 2016 | Category: Hints & Tips, New Feature! Supplier Rules come to the inbox. Our research has found that users who utilise the efficiencies from Receipt Bank supplier rules feature process items on average 35% faster than those that don’t. 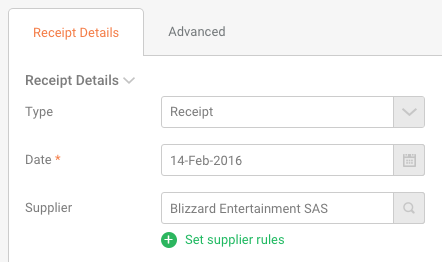 We want all of our customers to benefit from this timesaving feature so we’ve made it even easier for you to set supplier rules directly from within the inbox. Next time you’re in the inbox, click on the set supplier rules link to review your supplier rules for the current selected supplier. Like the Pareto principle suggests, 20% of suppliers generate 80% of the payables transactions for a business. Setting a few rules for the regular 20% suppliers can result in huge time savings in inbox review. To learn how you can use these rules to automate your inbox workflow read more about supplier rules here.